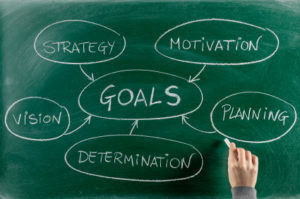 I’m sure we all know that goal setting is very powerful when it comes to achieving results. After all, if there’s no target, how do we know if we have been successful? There’s a great story about why 3% of Harvard MBA students make 10 times more than the other 97% – they all had goals written down with plans to accomplish them. Items per transaction – (IPT) how many items each customer buys – also called UPT. There is a number more, but these are the key ones we focus on and help our clients to improve on. As I suggested in the video, the easiest way to introduce a goal setting process is by team (or store). This way no individual feels pressured or singled out and it’s the entire team who have the goal to achieve. A great way to start but it can hide poor performance. The goal can be achieved by the effort of a few individuals, not the entire team, so top performers can often get frustrated, as they are carrying the load and poor performers can coast. I much prefer individual goal setting – providing it’s fair and achievable. This is why in my opinion conversion rate and IPT are the best as they don’t depend on how many customers the staff member serves. Individual goal setting gets your team to take responsibility for their own performance plus it’s a fantastic coaching tool. It identifies who is doing well (meeting or exceeding their targets) and therefore the consequence should be positive feedback. Maybe rewards if they are used wisely. It also highlights individuals who need more help (they haven’t met their goal). You can then have a separate conversation with these staff and identify what the roadblocks are and what additional training or guidance they need. Tracking the results on a simple goal sheet also provides a powerful reminder of where the store or individual staff member is at. Getting staff to write in their own results provides another layer of accountability. So if you’d like your business to be part of the 3%, write down your goals and follow up with your team.